This graphic from the district’s Independent Financial Review Panel’s November 2015 report shows the contributions the district must make to CalPERS and CalSTRS under new pension reforms. LA Unified is facing a budget deficit that will increase to nearly half a billion dollars within the next three years primarily due to declining enrollment and increased pension and healthcare costs. 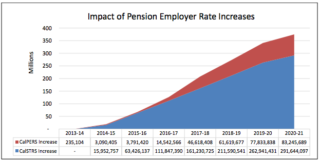 LA Unified’s total unfunded liability for other post-employment benefits (OPEB) is $13.6 billion (or more than 1.5 times its 2016-17 operating budget of $7.6 billion). 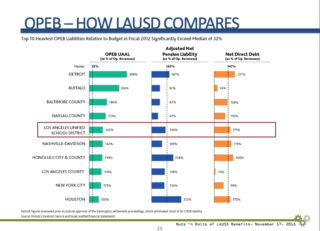 LA Unified is the only school district on a list of top 10 government entities across the country that can’t afford their OPEB obligations — the top spot going to the city of Detroit. According to the superintendent’s 2016-17 budget, the district will pay $566.8 million this year to the California State Teachers Retirement System and $139.4 million to the California Public Employees Retirement System. *UPDATED: This story has been updated to clarify the costs include other post-employment benefits.